Last Thursday, the opening of the 14th Australasian Congress on Genealogy and Heraldry Congress 2015 was held in ANZAC Hall at the Australian War Memorial. Family Historians, Genealogists of all ages gathered together in excited anticipation among the magnificent old planes from the first and second World Wars, to meet old and make new friends. 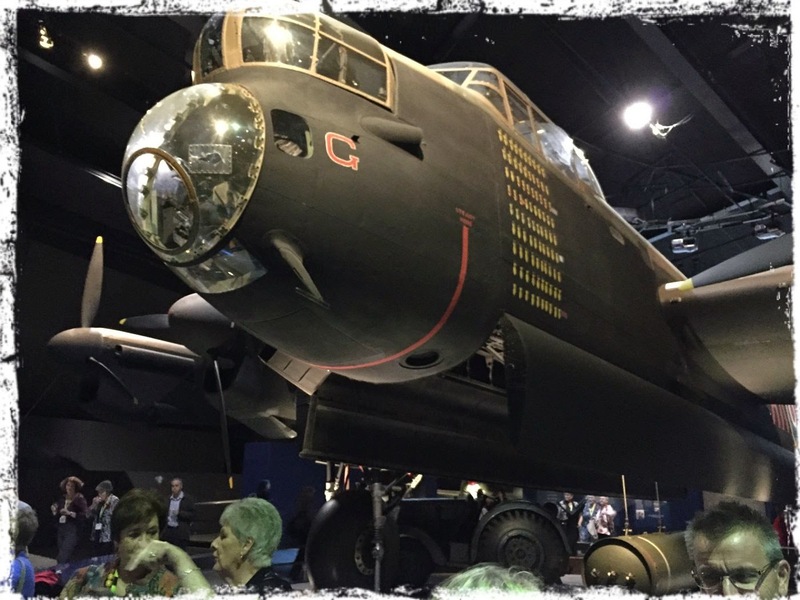 The Avro Lancaster MK Bomber "G for George" towering above the crowd set an imposing back drop for the evening and made a fitting setting for the opening of the Congress. Wall of Poppies in the Courtyard. Prior to the opening event I took the opportunity to take a tour of the War Memorial. It has been almost 12 years since I last visited the War Memorial. Why it has been that long, I don't know! As time was limited, I head straight to the commemorative courtyard and the Roll of Honour that surrounds the Pool of Reflection and the Internal Flame, to search for the name of my great great Uncle Alexander McDonald who died on the 25 April 1915, while assisting his troops disembarkation at Anzac Cove, Gallopoli. It didn't take me long to locate his name among the members of the First Field Company of Engineers. The courtyard was glowing with thousands of red poppies that visitors had placed against the names of the soldier's from their family. School children, gathered around the courtyard, some placing poppies against solders names, others chatting among their friends and hanging over the balcony waiting for the "Last Post" ceremony that is performed every day at 5.00pm. A hush fell over the courtyard as the officials took their place in front of the Hall of Memory. School children and visitors quietly stood around the pool of reflection waiting in anticipation for the ceremony to begin. The emotional effect of this ceremony was remarkable, as the 200 or so children who had been skylarking and chatting among themselves only 10 minutes before were quiet and subdued, thoughtfully reflecting of those who had made the ultimate sacrifice for their country. Representatives from each of the schools placed wreaths at the front of the pool of reflection. 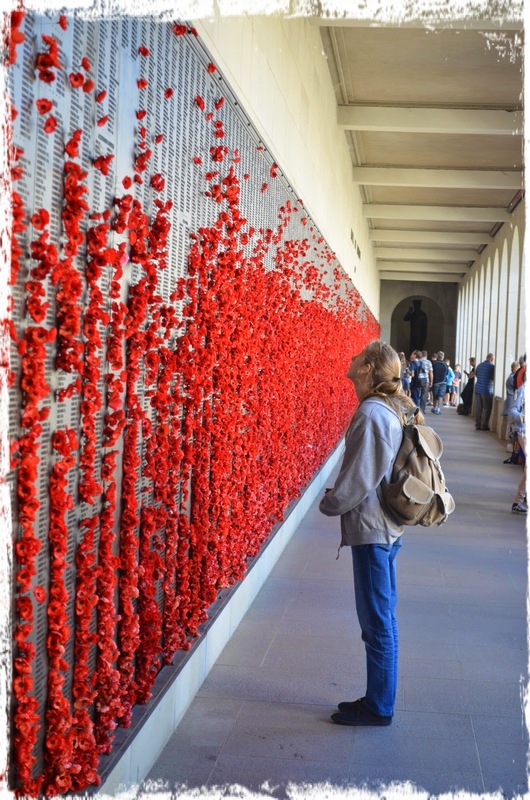 Then an elderly couple, either brother and sister, or husband and wife, assisted by memorial staff made their way carefully to the Pool of Reflection and placed a wreath of Australian flowers and red poppies gently next to the other wreaths. It was obvious that they had made a special journey to the War Memorial and had arranged to place their floral tribute in memory of a relative. As I wiped a tear from my cheek, I watched this thoughtful and solemn placing of their wreath and wondered if they were remembering the face of a long lost sibling or a father they didn't get to know. The late rays of the afternoon sun reflected on the water of the Pool of Remembrance as the last post played. All was silent and reflective! With in minutes the school children and other visitors made their way out of the memorial, some reflective, others chatting with excitement at the prospect of the events of the upcoming evening. As I made my way out to the front of the Memorial, I noticed the elderly couple from the ceremony outside, taking photos of each other. Capturing another memory of a day that held a great significance for them. The AWM is such a special place isn't it Diane? I am always cross with myself that I never ever have enough or spend enough time there. So True. I have to go back again soon and have another good look around ! So much to take in! It is such an evocative place isn't it, and I too didn't have enough time though I've visited often.